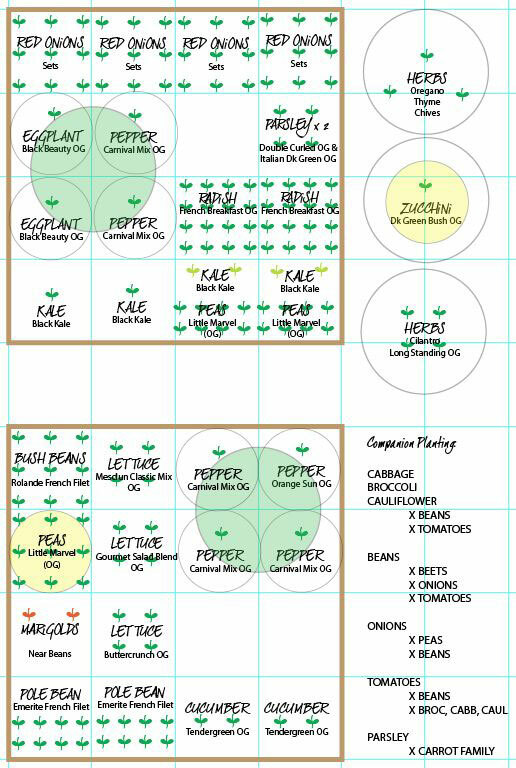 Here’s my most updated garden plan. I have four 4′ x 4′ boxes. (Well, I have three and the fourth one is on order.) The other circles you see are pots around the yard. I will be planting some of these large pots with things like zucchini and pumpkin, that would otherwise take up too much space in the raised beds. I also decided to put most of my herbs, many of which are perennial, in separate pots as well. 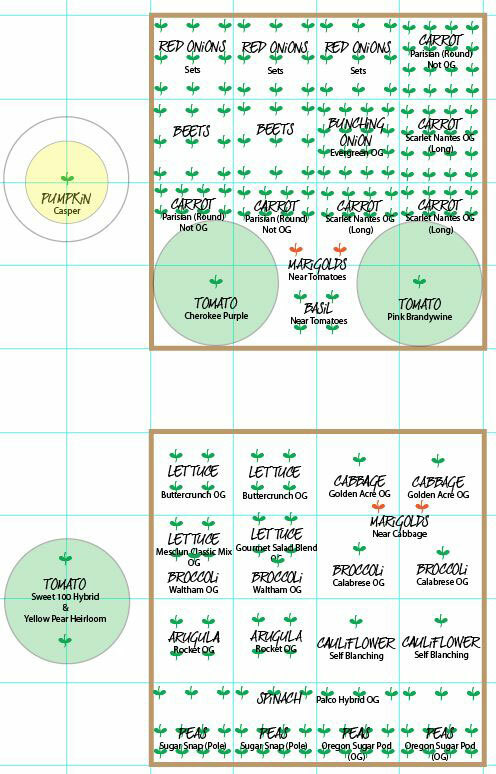 My garden plan also shows how many of each thing I’ve planted per square, following the guidelines in Mel Bartholomew’s All New Square Foot Gardening book. The first box is 16.5″ deep. All others are 11″ deep. The large, round pots are about 20″ in diameter, and just as deep. I didn’t believe Mel Bartholomew’s suggestion that you only need 6″ of soil. I set up myself up for success with deeper beds of Mel’s suggested soil mix. To give you a sense of direction, North is at the bottom of the page, where most of the trellised plants are located. My entire garden enjoys full sun exposure, without any obstructions. Since that is the case, I’ll be hoping to hide some lettuce behind the shade of other, larger plants as the summer heats up. Mulching and shade cloth will be a future topic of discussion, I’m sure. Please leave me your comments and suggestions! I’d love to hear what you think of my plan.